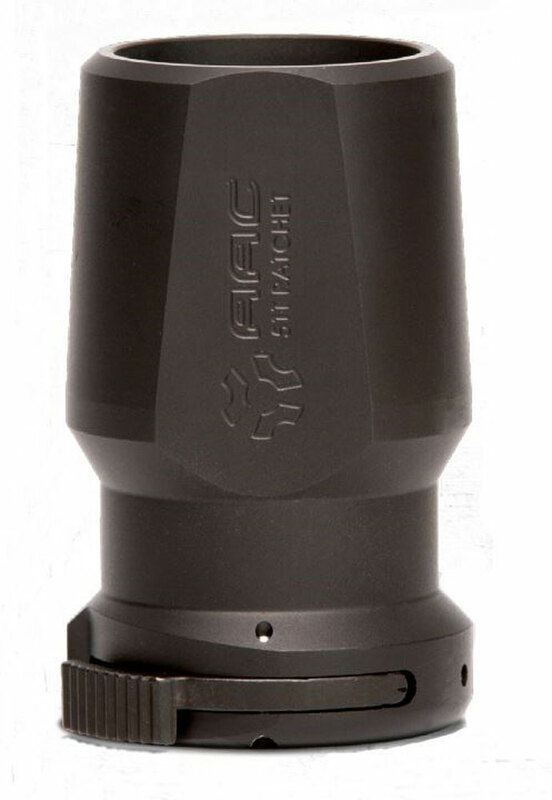 The AAC BlastOut 51T is a muzzle accessory designed to improve the modern sporting rifle user experience by significantly reducing blast pressure and concussive forces. The design directs the muzzle blast forward of the shooter. Range neighbors, training partners, and team members lateral of the muzzle benefit by the blast re-direction. BlastOut 51T works on all existing AAC 51-tooth mounts regardless of caliber and device type (flash hider, compensator, or brake). The proven industry-standard 51-tooth mounting system allows for quick and easy one-handed operation. The steel body is designed for hard-use and long-term durability while a nitride finish creates a wear-resistant surface. The BlastOut 51T adds only 6 ounces in weight and negligible overall length. Body Diameter - 1.50". Body Outer Diameter Max at Latch - 1.57".